Margaret MacGregor ('Peggy') Angus (1904-1993), Painter. Sitter in 1 portrait, Artist of 2 portraits. Ishbel Allan MacDonald (Mrs Ridgley, later Peterkin) (1903-1982), Political hostess and local politician; daughter of (James) Ramsay MacDonald. Sitter in 5 portraits. Margaret MacGregor ('Peggy') Angus (1904-1993), Painter. Artist of 2 portraits, Sitter in 1 portrait. 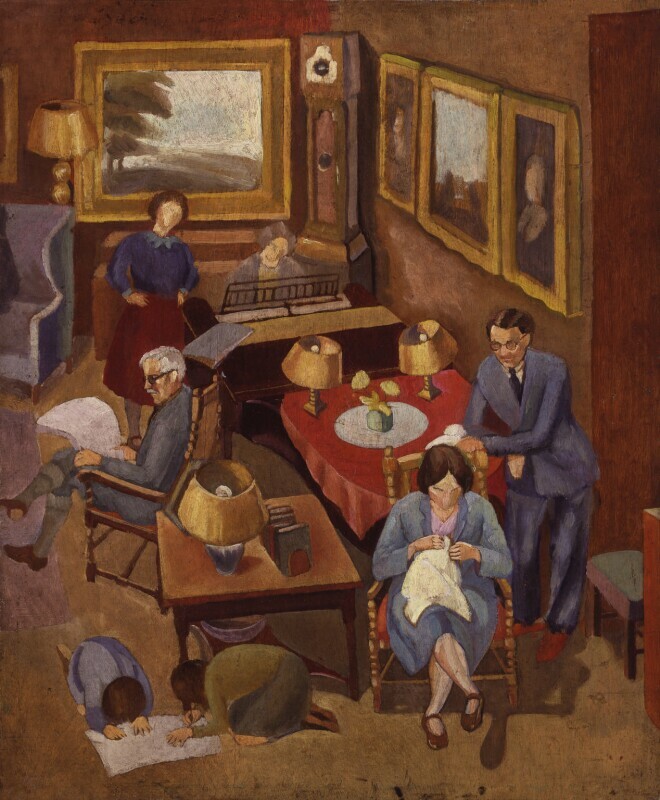 This group was painted at Chequers and shows the artist (standing by the piano) with members of the Macdonald family: Ramsay Macdonald is seated reading a newspaper and in the foreground is his son Malcolm (standing, right) and his daughter Ishbel (seated, right). The family's housekeeper is at the piano, and Alister Macdonald's children play on the floor.